A couple months back, Jun Lozada testified on TV about the ZTE deal that would have granted a broadband contract to China that was greatly overpriced, some say by $130 million…and lots of people suspect that the excess money will go to gifts to various people to thank them for helping get the contract. Since then, the case has been smouldering along. Will it bring down the Arroyo government? Probably not. Arroyo is like Bill Clinton: So competent you hate to get rid of her just because her administration is “business as usual” when it comes to shenanigans. And she is able to play hardball…oh no, not the gentlelady, but others who just happen to dislike the slime of her accusers. Lozada, whose testimony on the huge bribes solicited by certain politicians involved in the ZTE deal made headlines, admits some minor shenanigans in his own forestry job, and is now being sued for corruption. Bishop Cruz, a major critic of the administration, is also being sued, for libel when he found out that some ladies were working for free at a politician’s spouse’s birthday party, and blasted the politician, and the ladies got mad. How dare he impugn their purity! And the Catholic bishops have just put up their hands in helplessness, figuring it is a battle between “the corrupt and the corrupt”. Can’t restart a People Power III if there isn’t anyone honest to take over. So, despite all the scandals, there has been no smoking gun to show any direct connection with President Arroyo. Poor girl, all these corrupt people in the government trying to smear her, and she’s busy feeding the poor with subsidized rice vouchers and saving the country. How dare they pick on her. 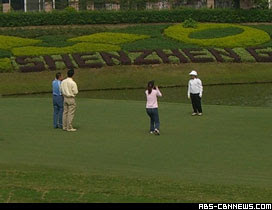 What good are photos of President Arroyo playing golf in Shenzhen with ZTE officials, as a witness claims? So two weeks have passed…and so far….well nothing. Up here in the provinces, the NPA had a shootout with the Army, the monsoon came early,school is starting soon, and everyone is busy fixing up the rice fields. Who has time to watch TV? But ABS-CBN now reports that the log jam might be breaking. The clandestine meeting between President Arroyo and officials of ZTE Corp. in Shenzhen, China on November 2, 2006 was the “turning point” that saw the Chinese company clinch the $329-million broadband contract, former House Speaker Jose de Venecia said Monday. But JdV still is hesitant about testifying, and if he did testify, would anyone believe him? In the meanwhile, it hasn’t stopped Pinoys from posting political satires on Youtube. Wikipedia has a summary, but with all the smoke and mirrors, admits it might not be accurate. So another scandal that has the potential to cause another impeachment of President Arroyo is still smouldering along. Will she survive? Or is she being maligned? Heck, I don’t know who to believe: my son believes the President, my husband believes Lozada. Nancy Reyes is a retired physician living in the Philippines. No user commented in " Photo Reopens ZTE Investigation…Maybe "